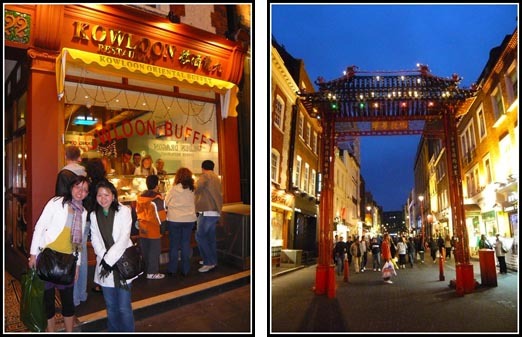 London’s Chinatown is the best place for home-sick Singaporeans craving for chicken rice or any other Chinese food. 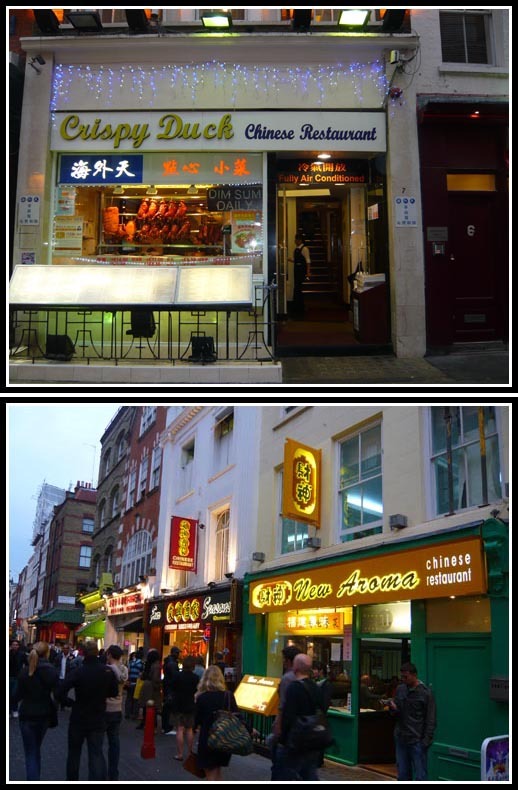 However, at £8-10 for a plate of chicken rice, it is quite expensive to eat in some of these Chinatown restaurants. 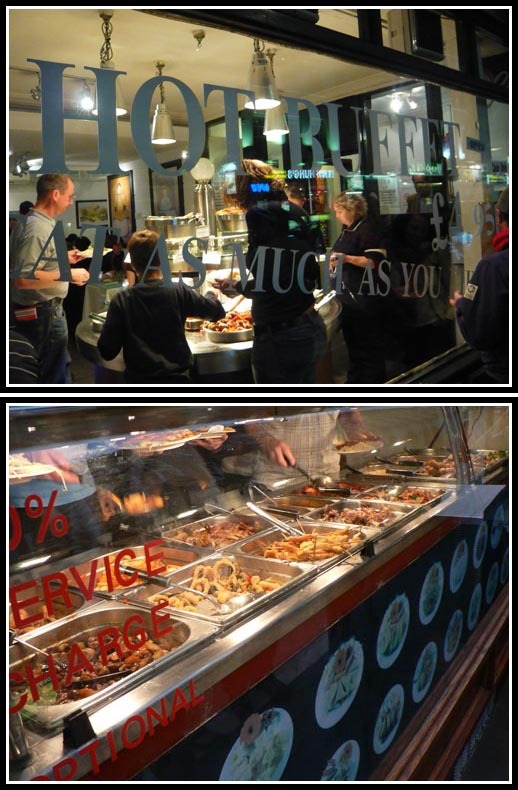 Fret not because while walking around Chinatown, we saw 2 all-you-can-eat buffet Chinese restaurants! We wanted to try the cheaper £4.95 buffet but it looked like there are quite limited food varieties. As it was so cheap, there were also very limited quantities due to the huge crowd in the restaurant. We decided to try the £8.50 buffet at the nearby Kowloon Restaurant because there seemed to be more variety and the food looked good from the outside. The boss of this restaurant is one clever marketer – by positioning all these food by the window, hungry and curious bypassers will gather at the window to look at what’s on offer at the restaurant. With this crowd standing by its window gawking at its food, the restaurant looked busy and popular, thus attracting more bypassers – a virtuous cycle for Kowloon Restaurant. Well, we were one of those curious and hungry people gawking at the food and we eventually succumbed to temptation and took up the buffet offer. The food is so-so in terms of taste and contains lots of carbohydrates – fried prawn, fried chicken, fried vegetables, thick noodles, thin noodles, rice. Some simple strategies to maximise the value of your buffet meal – eat the more highly prized food (e.g. duck meat, prawns) first, food containing carbo fill up your appetite quicker so they should be KIV-ed. While it was stated at the window that the 10% service charge is optional, they have took it onto themselves to include it into the bill, assuming we will pay for their “excellent” service (which we did to avoid the fuss of arguing over 85 pence). The only good thing about this Kowloon Restaurant is that you will feel very full and satisfying after the buffet meal, especially after a long day of walking and shopping around London. Hello ! Your blog is so interesting !!! .-= Leonny´s last blog ..Anya and Vai : Two Years Ago =-. when I was in western countries, I really look forward to eating rice! too much about bread can make me sick 😛 Also, instant noodles would become my favourite dish!! .-= Mr Whattaworld´s last blog ..Swedish Meatballs for Lunch =-. I’m happy I found this blog, I couldnt discover any info on this subject matter prior to. I also operate a site and if you want to actually serious in a little little bit of guest writing for me if possible feel free to let me know, i am always look for people to take a look at my website. Please stop by and leave a comment sometime! Wow!!! Your blog is awesome as it contains informative stuff. Really helpful blog. Keep posting.